Camille Pissarro (July 10, 1830 – November 13, 1903) was a French Impressionist painter who was called the "Father of Impressionism" for his pioneering efforts, his patriarchal relationship to younger painters like Paul Cezanne, and his contribution to the formation of the genre's style, practices, and exhibition policies. Of Jewish and Creole descent, Pissarro was father to a large family of talented progeny, including his son, the painter Lucein Pissarro. His great-grandson, Joachim Pissarro, was named a curator of the Department of Drawing and Painting at the Museum of Modern Art in New York City in 2003, and great-granddaughter, Lelia, is a successful painter who resides in London, England. Pissarro, a self avowed anarchist related to common people and their everyday lives. As such, his work drew on a wide choice of subjects, themes, and motifs—a diversity that escapes conventional categories and reflects his inner freedom as an artist. He once said, "Blessed are they who see beautiful things in humble places where other people see nothing." His pragmatic philosophy can be seen reflected in his own lifestyle: He married a cook's assistant who bore him eight children. Jacob-Abraham-Camille Pissarro was born in Charlotte Amalie, St. Thomas, to Abraham Gabriel Pissarro, a Portuguese Sephardic Jew, and Rachel Manzana-Pomié, from the Dominican Republic. Pissarro lived in St. Thomas until the age of 12, when he left for boarding school in Paris. He later returned to St. Thomas to work in the family business, spending much of his free time drawing sailing ships at port, native fauna, and everyday life on the island. In 1852, at the age of 23, he "ran away" to Venezuela with the Danish artist Fritz Melbye, who was to be his first early influence. In 1855, Pissarro returned to St. Thomas, and this time with his parents' blessing, left for Paris to further his artistic studies at various academic institutions, including the École des Beaux-Arts and Académie Suisse. Among his teachers were the master of realism, Gustave Courbet, and Charles-François Daubigny, an artist whose work was an important forerunner to Impressionism. The Barbizon group and the landscapes of Jean-Baptiste-Camille Corot, are also considered the most important of Pissarro's early influences. 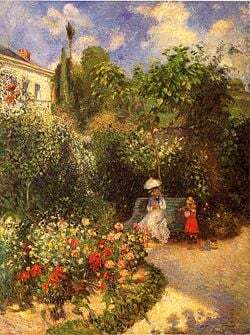 The garden of Pontoise, painted 1875. It was while in Paris that Pissarro became friends with artists Claude Monet, Pierre-Auguste Renoir, Alfred Sisley, and Paul Cezanne, who, like Pissarro, were seeking alternatives to the established methods of painting. Their newly formed alliance under the banner of Impressionism received criticism from the artistic establishment of the Paris Salon. In 1874, after having been repeatedly rejected by the Salon, the Impressionists held their own exhibition of "independent" artists. Pissarro, along with Edgar Degas, was the only Impressionist artist to show his work at all eight Impressionist exhibitions held between the years 1874 and 1886. As an artist and mentor, Pissarro was steadfast in his dedication to Impressionism and in his tutelage of younger artists. During the Franco-Prussian war of 1870-1871, Pissarro and Monet traveled to London where they were impressed by the landscape paintings of John Constable and J.M.W. Turner. While in London, Pissarro painted local views including the new Dulwich College, Lordship Lane Station, and St. Stephen's Church. In 1890 he returned to England and painted several scenes of central London. Pissarro married Julie Vellay, a maid in his mother's household. Of their eight children, one died at birth and one daughter died at age nine. The surviving children all painted, and Lucien, the oldest son, became a follower of William Morris. Many of Pissarro's paintings from 1868 and 1869, were destroyed when his house in Louveciennes was occupied by Prussian troops, which made it difficult to establish an exact chronology of his artistic development. However, in 1892, a large retrospective of his work that was held in Paris finally brought Pissarro international recognition after a lifetime of enduring rejection. His most critically received paintings were: Path through the Fields (1879), Landscape, Eragny (1895), and Place du Theatre Francaise (1898). 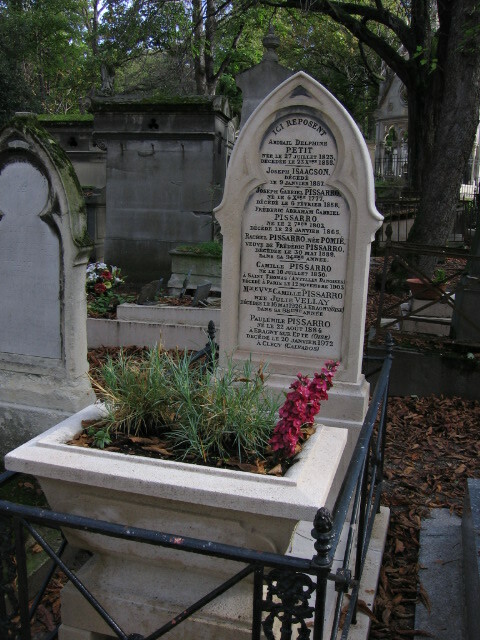 Pissarro died of blood poisoning in Éragny-sur-Epte in November 1903, and was buried in Père Lachaise Cemetery in Paris. Pissarro painted rural and urban French life, particularly landscapes in and around Pontoise, as well as scenes from Montmartre. Orchard scenes were painted at his country house at Éragny-sur-Epte, as were gardens, and fields—all painted under varying conditions of morning and evening sunlight, rain, and fog, perhaps to accommodate the growing eye trouble he experienced towards the end of his life. His finest early works, like Jalais Hill, Pontoise, are characterized by a broadly painted (sometimes with a palette knife) naturalism. Like Monet, Pissarro sought to depict the fugitive effects of light at a particular moment; he also, however, depicted the life of the street, as in Place du Theatre, which affords a view of a crowded Paris square from the vantage point of fixed point high above the ground. Pissarro not only offered substantial contributions to Impressionist theory, he was a primary developer of Impressionist technique, as well. The Impressionists, influenced by the development of photography, used spatial effects and soft focuses, sometimes cutting off a scene at the edges of the frame in an arbitrary manner. The motif should be observed more for shapes and colors than for drawing. Precise drawing is dry and hampers the impression of the whole; it destroys all sensations. Do not insist on the outlines of objects, it is the brushstroke of the right value and color which should produce the drawing. - Don't work bit by bit, but paint everything at once by placing tones everywhere… The eye should not be fixed on a particular point but should take in everything, while simultaneously observing the reflections that the colors produce on their surroundings. Keep everything going on an equal basis; use small brushstrokes and try to put down your perceptions immediately. Do not proceed according to rules and principles, but paint what you observe and feel. From 1885-1890 Pissarro experimented with Neo-Impressionist ideas. Discontented with what he referred to as "romantic Impressionism," he investigated Pointillism, which he called "scientific Impressionism," before returning to a purer Impressionism in the last decade of his life. 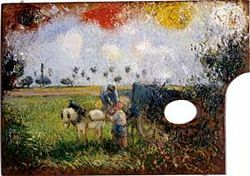 Pissarro's Palette with a Landscape, c. 1878. A renowned teacher, Pissarro counted among his pupils and associates American Impressionist Mary Cassatt and Californian Impressionist painter Lucy Bacon who traveled to Éragny-sur-Epte, France, to study under his sponsorship. During his lifetime, Camille Pissarro sold few of his paintings. In 2001, Pissarro's, Rue Saint-Lazare (1893) sold for $6.6 million. Pissarro's Rue St. Honore, Apres Midi, Effet de Pluie, (oil on canvas, 1897), of a rainy Paris street scene, is presently displayed in the Thyssen-Bornemisza Museum in Madrid, Spain. It was confiscated by the Nazis in 1939, from the Cassirer family in Germany, and is presently the subject of a recovery effort in U.S. federal court by Holocaust survivor Claude Cassirer. Mr. Cassirer is a cousin of the German philosopher Ernst Cassirer, and also a cousin to gallerists and publishers, Paul and Bruno Cassirer, who championed the Impressionist movement outside of France. The value of Rue St. Honore has been estimated at $20 million. "I regard it as a waste of time to think only of selling: One forgets one's art and exaggerates one's value." "Paint the essential character of things." "When you do a thing with your whole soul and everything that is noble within you, you always find your counterpart." "Everything is beautiful, all that matters is to be able to interpret." "All the sorrows, all the bitternesses, all the sadnesses, I forget them and ignore them in the joy of working." ↑ "Camille (Jacob) Pissarro," in International Dictionary of Art and Artists (St. James Press, 1990). ↑ Robertgenn.com, Art Quotations by Camille Pissarro. Retrieved September 18, 2007. ↑ Wold Eiermann, "Camille Pissarro 1830 – 1903," in Christoph Becker, Camille Picasso (Hatje Cantz: Ostfildern-Ruit, 1999), 1. ↑ Artknowledgenews.com, Pissarro Exhibition with sound. Retrieved September 18, 2007. ↑ "Camille Pissarro" in Encyclopedia of World Biography (Gale Research, 1998). ↑ The John Hay Whitney Collection, National Gallery of Art, Washington. ↑ Csmonitor.com, US lawsuits pursue lost art. Retrieved September 18, 2007. "Camille (Jacob) Pissarro." In International Dictionary of Art and Artists. St. James Press, 1990. "Camille Pissarro." In Encyclopedia of World Biography, 2nd ed. 17 Vols. Gale Research, 1998. All links retrieved January 7, 2017. "Photograph of Pissarro's Mausoleum at Cimitiere Pere Lachaise, Paris". Groundspeak.com. This page was last modified on 7 January 2017, at 16:17.